Over the years there have been a number of different Spider characters featured in various comic books and other media. Then the "Spider-Verse" concept was first published as a comic book in 2014, which aimed to bring some of this together with alternative versions of Spider-Man in different universes. The screenplay of "Spider-Man: Into the Spider-Verse" picks up this concept and follows the story of Miles Morales, a New York teenager from one universe who meets the Peter Parker Spider-Man and then teams up with other alternative counterparts to battle a threat to the entire multiverse. Written by Phil Lord and Rodney Rothman, the movie is an animation so in some ways it is truer to its comic-book origins than other live action MCU movies. But don't let that fool you into thinking this is lightweight stuff, the movie is garnering rave reviews from film critics as well as comic book fans. The film has won numerous awards including Best Animated Picture at the Golden Globes and also at the BAFTAs, and also nominated in that category for the Oscars. The score composer is Daniel Pemberton who has a wealth of experience in television and video games but a comparative newcomer with "only" 10 years experience in film. Pemberton is rightly noted for his willingness to experiment and his stylistic flexibility, including an ability to seemlessly blend styles into something new. His approach on "Spider-Man: Into the Spider-Verse" would seem to focus on the urban setting and in particular the trials and tribulations of a teenager in that setting coming up against a series of mind-boggling concepts. 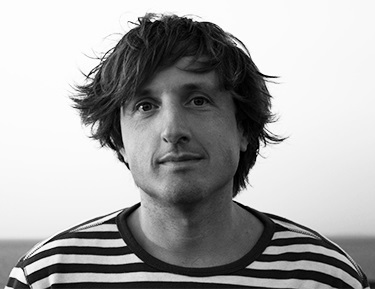 In his cover notes for the album Pemberton describes how he came up with the idea of using sounds generated on a DJ turntable as a key element in his score, considering that a teenager might well be listening to this type of music. Although this could all have been done electronically Pemberton did it the hard way, by writing and recording a range of music and sounds on vinyl to be scratched meticulously for re-recording and further mixing. It sounds as complicated as the film's plot, but the results are simply astonishing. The scratching sounds permeate much of the score and give it a cool hip-hop vibe that is mixed with electronics and more traditional orchestral scoring. The resultant score is urban, electronic, scratchy, hip-hop and gritty, and this could decribe individual sounds as well as the the way they are combined. The first track "Into the Spider-Verse" establishes an evolving soundscape and then layers on this a crescendo leading to a veritable explosion of scratching sounds. 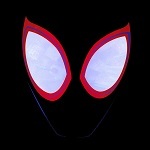 "Only One Spider-Man" establishes a hip-hop track with drum-kit, electronics and orchestra which all serve to establish the pallet and set the overall mood musically. Then "Visions Brooklyn 1, 2, 3" introduces a whistling theme against a hip-hop percussive beat. This whistling is like a (60 years later) evolution of the whistling in "West Side Story", very cool and street. "Security Guard" is then all drum-kit and percussion, "Comic Book" returns to the hip-hop orchestral hybrid while "Green Goblin Fight" is part EDM and introduces a bunch of truly scary electronic howls. By now it should be clear that almost anything goes sonically in this film score, though there are also a number of constants which help to ground the score in a single if wide-ranging sound world. One of those constants becomes clearer in "The Amazing Spider-Man" with its short hero theme or 3-note leitmotif, and later there's another 3-note motif which leaps up and then down an octave. There are 41 tracks on the CD album and 44 tracks on the download version, and it will suffice for the purposes of this review to give you a flavour of the diversity on offer. While the hip-hop beats, percussion riffs, vinyl scratchings, electronics and orchestral layers continue throughout the score, there are some lighter quieter moments. "Mi Amor" is lyrical and romantic, "Rest in Peace" starts with a sad orchestral lament, "For the Love of MJ" starts as a piano ballad before being joined by strings, and "Aunt May and the Spider-Shed" also reduces the tempo a little, but it gets wild with jokes and clowning towards the end. However, much of the remaining score is far from calm. You will hear "Cemetery Splat" with scratchings and recorded sounds against a bongo beat, while "Catch the S Train" is like a DJ on fire, gouging out trashy grooves on his turntable while a jazz combo plays some musak in the corner. "Quantum Physics" has some dripping sounds in an echo-chamber strike up a new groove, "Alchemax Infiltration Plan" has a military band with brass and snares on acid, "Kingpin Clicks" has some mangled strings, and in "The Prowler" you will hear more animal-in-pain noises like a howling/roaring followed by some frantic scurrying, and watch out for the doorbell in "Breakdown the House.."! The hip-hop beats and dirty scratchings continue throughout the score, but overall the pallet becomes more orchestral as the story becomes more action-oriented. Many composers have blended orchestra with electronics and other genres before, but not quite like this! The music style is still recognisably Pemberton's but it is like he has dialled it up to 11, as though his career so far has been leading up to this film score. The film score is truly outstanding or in a single word "dope". 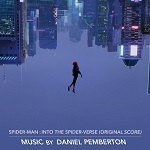 The "Spider-Man: Into the Spider-Verse" score is highly recommended and it is available at these links: Amazon.co.uk and Amazon.com. There is also a song-track album which hasn't been reviewed but for the sake of completeness you can find it at: Amazon.co.uk and Amazon.com. These are the CD album tracks - scroll down to find 3 additional tracks that are only available for download.